If Alaska is on your mind, you are in the right place. Amanda Watkins Travel knows all of the best ways to explore Alaska - whether by sea (on a cruise) or on land (at a luxury lodge like the ones described below) or both! Click here to learn more about Amanda Watkins Travel. Click here to get started planning your Alaskan dream trip! This past summer my family experienced the most extraordinary 5 nights at Tutka Bay Lodge in Kachmak Bay near Homer, Alaska. I was looking for an experience that would be educational for the kids, enjoyable for my husband and I, and would allow us to experience unspoiled nature. Alaska appealed to me for numerous reasons…the summer weather, the wildlife, and its remoteness to name a few. We had already experienced an Alaskan cruise and now wanted explore Alaska by land. 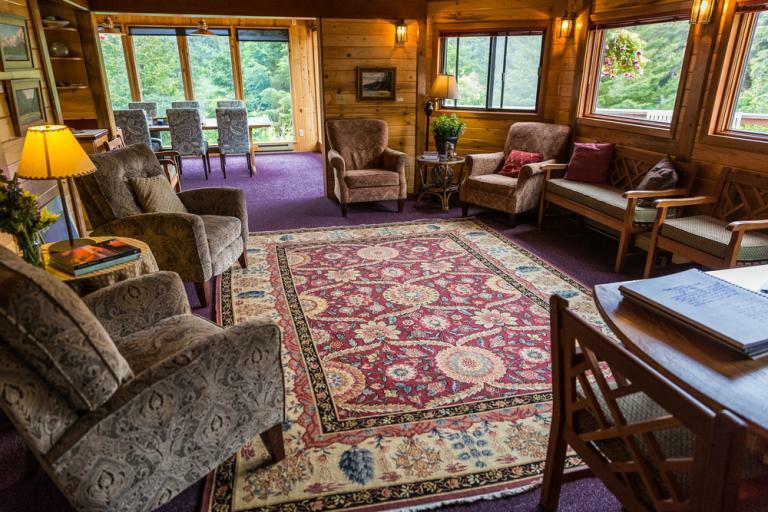 Enter Tutka Bay Lodge, a Virtuoso resort. 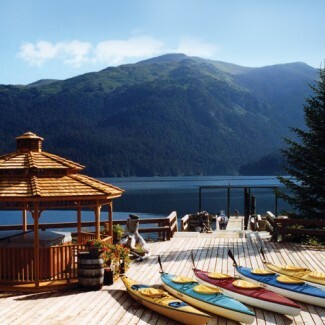 Tutka Bay Lodge is eleven-acre property offering a main lodge, six private guest accommodations, a sauna, hot tub and boat house – all connected by a boardwalk. A large deck offers seating, a hot tub and a steam banya - as well as an area for helicopter landing. And, somewhat unexpectedly, a short walk down the boardwalk finds you at the acclaimed Cooking School at Tutka Bay. On the short walk up to the main lodge you pass the spa cabin and the Lodge’s garden which seems to be a favorite chill spot for bunnies, chickens and the resident porcupine. 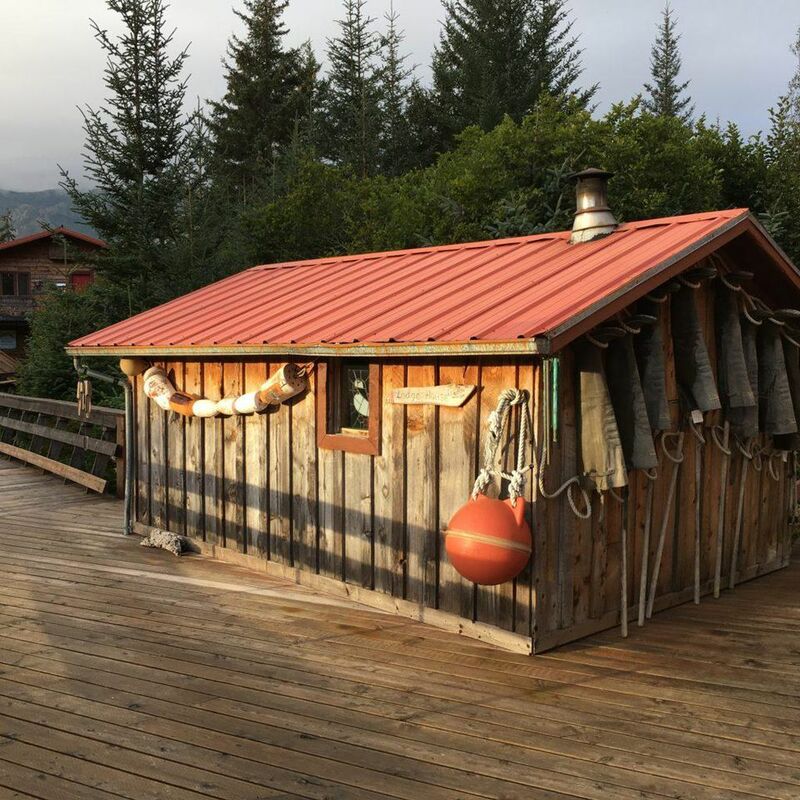 Upon our arrival at Tutka Bay Lodge via water taxi from Homer (you can also take a water plane from Anchorage) and were shown to Kittiwake Cabin – our cozy home for the duration of our stay. On the first floor there was a king bed, sofa, and bathroom. 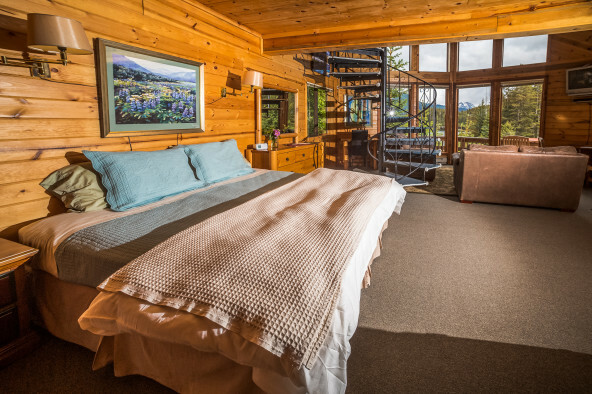 A spiral staircase let upstairs to a large room with two double beds and one twin. While the décor was charmingly rustic, the linens, robes and toiletries were nothing but luxury. Shortly after settling in, we met Karyn - our guide during our stay. Each family is assigned their own naturalist who tends to their itinerary, answers any and all questions and makes sure that every single need is being met. I had no idea at the time that Karyn was absolutely one of the smartest human beings I have had the pleasure of meeting. But I quickly found out. Karyn was not some college kids working they way through summer. 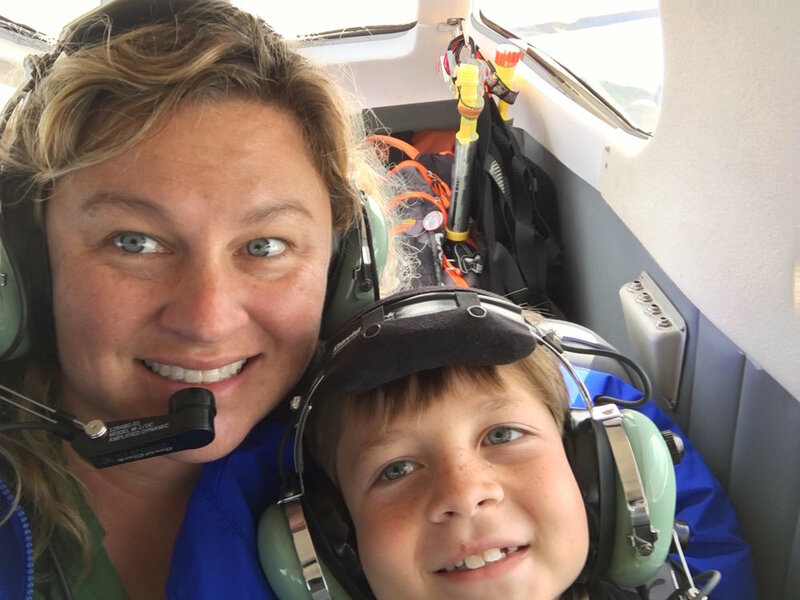 Karyn is a physicist who has accomplished some pretty amazing things in her life. She now chooses to spend her summers at Tutka Bay Lodge sharing her knowledge and love of nature with others. In minutes, she had my kids belly down on the pier doing what she called “belly button biology”. They were looking through the wide slats of the pier and she was helping them identify the various anemone and sea life. Food is taken very seriously at Tutka Bay. This is because Tutka is the brainchild of Cordon Blue graduate and famed food writer Kirsten Dixon and her husband Carl. Menus are thoughtfully – even lovingly – planned out. Even the music playing in the kitchen while the chefs are cooking seems to pair beautifully with that days menu. Guests are actively involved in the process as they often forage for the berries and catch the fish that is served. The menu is posted each morning and if a guest needs modifications, they are more than willing to accommodate. In fact, this is a fabulous place for travelers with gluten sensitivities. They beautifully accommodate gluten free guests and even make their own gluten free bread and pastries. Dinner at Tutka is a casually elegant affair. There is a pre-dinner cocktail hour with an assortment of cheeses and appetizers such as gougère with crispy prosciutto and wild herbs or rockfish fritters. You enjoy the company of the other guests while sipping on the wine selected for that evening and sharing your days adventures. While the adults chatted, the kiddos would play in the garden with the bunnies and look for the elusive porcupine that frequented the area. We would all come together to enjoy dishes ranging from from elk medallions to short rib ravioli to salmon with risotto. Desserts were painstakingly made from scratch by the pastry chef. If you have picky kids – no sweat – they will happily whip up something that your kids will enjoy. After dinner activities vary depending on the guests, the weather and whimsy of the staff. One night after dinner we hopped on the boat to go whale watching. Another night they made a bonfire on the beach and we enjoyed homemade s’mores (with homemade marshmallows!). Now here is where it gets REALLY exciting. Let me tell you how we spent our days! Day 1: We kayaked over to a small little island, built a bonfire and had lunch. We explored in the woods, played in the sand and listened to the bald eagles. Later that afternoon, we went out on Tutka’s boat and saw more Orca’s than I could count. Day 2: The boys went deep sea fishing for halibut and Hattie and I, along with other guests and guides, picked berries to be included in that evening’s dessert. Later, Karyn took Hattie for a hike and I enjoyed one of the best massages I have ever had! Day 3: We flew via seaplane and landed on the beach of a very remote area Alaska to view brown bears. We were literally the only people for hundreds of miles. We were able to get so close to the bears – who could have cared less about our presence! Watching them in their own, undisturbed habitat fishing for salmon was one of the most amazing things I have ever witnessed. Day 4: We took a helicopter and landed on a glacier where we saw wolves and more bears. We drank the glacier water and brought back some glacier ice for our evening cocktails. We were freezing when we got back, so we all raced into the Banya for a steam. Combine your stay at Tutka with 3 nights at their sister property Winterlake Lodge to also experience interior Alaska. If your stay requires overnighting in Anchorage, try to stay at Hotel Captain Cook. Consider renting a car in Homer and driving back to Anchorage. The drive is beautiful and you can make a stop at the Alaska Wildlife Conservation Center. Welcome gift basket with the Lodge cookbook and snacks.